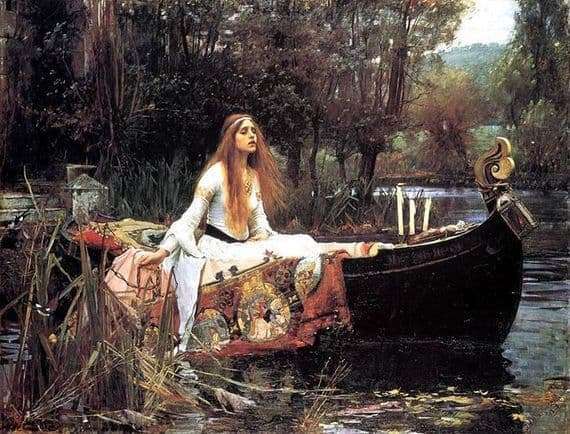 The most famous painting “Lady of Shallot” is the work of J. W. Waterhouse, master of painting from England. This masterpiece of art Waterhouse dedicated to the girl Elaine. This lily maiden is the heroine of the legends of King Arthur, who sincerely loved Lancelot and died of unrequited love. The theme of the femme fatal women who have been left by beloved men has always troubled Waterhouse. The artist very accurately portrayed the drama of the plot, demonstrating his mastery of the painting technique. And his popularity has expanded thanks to the charming models. By the way, there is an opinion that his wife posed for the master of the brush while writing this picture. A true masterpiece of art “The Lady of Shalott” – the first of the works of the artist, written in the motifs of the poem by Tennyson. The picture tells the tragic story of a damned young girl. This maiden enclosed in a tower must continuously weave a very long cloth. The action takes place on the island of Shalot. No one realizes the existence of Elaine, the girl herself is strictly forbidden to leave the tower, you cannot even look out the window. All the beauty of the surrounding world is reflected for her only in a huge mirror that hangs on the wall. But one day, upon seeing his beloved Lancelot, Elaine leaves the walls of the tower. At this moment, the curse is in effect: the canvas is dissolved, cracks appear on the mirror. Realizing that he had acted thoughtlessly, Elaine runs to the river, where she finds a boat and writes her name on it. In the picture of Waterhouse, we already see the moment when a girl floats by water and sings a sad song. The artist filled the picture with its meaning, reflecting the views of humanity of the Victorian era. The lady of shallot is depicted by the artist’s brush very skillfully. The girl has already sat in the boat, in her hands – a chain that secures the boat to the shore. A woven tapestry – the work of her whole life – hangs from the boat into the water. Details depicted by the artist, such as candles and a crucifix, give the boat the appearance of a funeral boat. Indeed, in those days a burning candle was a symbol of life, and on the canvas two of them were extinguished. Elaine herself looks at them sadly, alone. The artist makes it clear that the girl’s life is about to end. Open mouth indicates that Elaine sings a swan song. In depicting the landscape, Waterhouse departs from the traditions of pre-Raphaelism. He does not paint nature in detail, but gives landscape description negligence.